Also on the LSU campus near Tiger stadium. There were some over 20 feet tall nearby before but they got removed for road improvements and these are the few that are left. 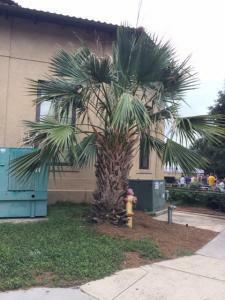 These are not Sabal palmetto but the arboreal form of Sabal minor. Wow, those must be old. I didn't know that Sabal 'Louisiana' could get that big. also this huge one on the LA University campus. stole the pic from an old palmtalk thread.